Supergirl returns to Kotobukiya's famous Bishoujo series! Supergirl Returns shows a completely different sculpt and is sculpted in detail from her natural blonde hair, serious yet cute expression, to the creases in her cape and skirt. 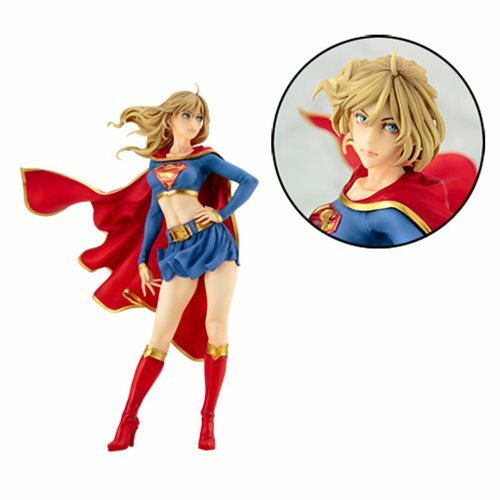 Based on the work by Shunya Yamashita, this Supergirl statue poses confidently with her hair and cape flowing along with the wind while showing off her lean muscles. The DC Comics Supergirl Returns Bishoujo Statue is in 1:7 scale and measures about 9 1/3-inches tall. The statue comes packaged in a closed box. Ages 14 and up.